We are currently facing the worst displacement crisis since the Second World War. More than 60 million people across the globe are fleeing conflict, poverty and persecution, either within their home countries or by fleeing abroad. For years now, a comparatively small proportion of these people have been attempting to make their way to Europe – to countries with welcoming asylum status policies. In order to gain a balanced perspective on the current European refugee crisis, with ever-changing headlines and differing numbers, here is all you need to know about the unfolding events and what we are doing to help. According to the UNHCR - 1,014,836 people made it into the EU zone by sea routes alone in 2015, and 3,771 either went missing or died trying. Eighty-five percent of arrivals came from the world's top 10 refugee-producing countries. Most people pass through Greece via Turkey and go on through the Balkans; others travel by way of the central Mediterranean, starting in Libya and ending in Italy – where many get stuck in reception centres. "It is impossible to see the people as numbers - or even as migrants or refugees - after experiencing a rescue. They are whole hearted and three dimensional human beings. There is no ‘the others’ – there is only ‘us’." These people are generally trying to move north to Austria, Germany and Sweden – places with high standards of living and welcoming asylum policies. With the number of displaced people across the world tripling in the last decade, the number of people attempting to reach Europe is not expected to slow down any time soon. The UNHCR has estimated that 850,000 people will attempt to reach Europe by the end of 2016. Refugees from across the world have attempted to reach Europe for decades, so why are people just beginning to pay attention this year? A number of crises across the Middle East and North Africa have created the ‘perfect storm’ for a refugee crisis. Now in its fifth year, there is no sign of the Syrian conflict abating. People still living in the country have all but given up hope and the Syrians living in neighbouring countries see little chance of returning home. They are now coming to terms with the fact they may have to look for a permanent solution to where they will live, and many are therefore seeking refuge in Europe. An astonishing 7.6 million Syrians have been internally displaced, with a further 4.1 million having fled to Egypt, Iraq, Jordan, Lebanon and Turkey (the countries bearing the brunt of the refugee crisis) since the start of the nation’s civil war in 2011. Combined, this is more than half of the country’s 23 million people. But, only around 394,000 Syrians have sought refuge in Europe since April 2011. Other insecurities in the Middle East are contributing to the crisis. The conflict in Yemen, where entire neighbourhoods have been designated as military targets, has led more than 100,000 people to leave their country. In Iraq, the advance of the so-called ‘Islamic State’ has led many to flee for their lives. The UNHCR estimate that 400,000 Iraqis are currently seeking refugee status. The collapse of government in Libya has left tens of thousands of migrant workers from areas such as West Africa, South Asia and the Middle East stranded at the hands of rivalling militias. For most of these people, the only way of leaving the country is by boat across the Mediterranean. In Egypt, which is now home to more than 130,000 Syrian refugees, the change in government has led to a loss of sympathy for Syrian refugees – to the extent that many Syrians feel the need to leave. A staggering three percent of Eritrea’s population has fled the totalitarian state, led by a brutal dictatorship where most citizens fear arrest at any moment. These are just a few examples of what has led to this perfect storm. People are also coming to Europe from other conflict-affected countries, such as Afghanistan, Somalia and Ukraine. MSF is working in many of these countries and can attest to the dangers people face and the difficulty they have in accessing adequate healthcare. It is worth noting that many people travelling through Europe to escape poverty actually come from within Europe. In the first six months of 2015, around 45 percent of asylum applications in Germany came from Balkan nations. With the prospect of spending a fifth winter in freezing, crowded and underfunded camps, many Syrian refugees residing in countries like Lebanon and Turkey are making the journey overland to Europe. People are also making the journey directly from Syria, or from Afghanistan and Iraq. Until September 2015, most people travelled through Turkey, then made the short, but no less dangerous, crossing by sea from towns on western Turkey’s coast, like Bodrum and Didim to Greece’s Dodecanese islands (Kos, Leros, Lesbos). But, people are beginning to make the entire journey overland. 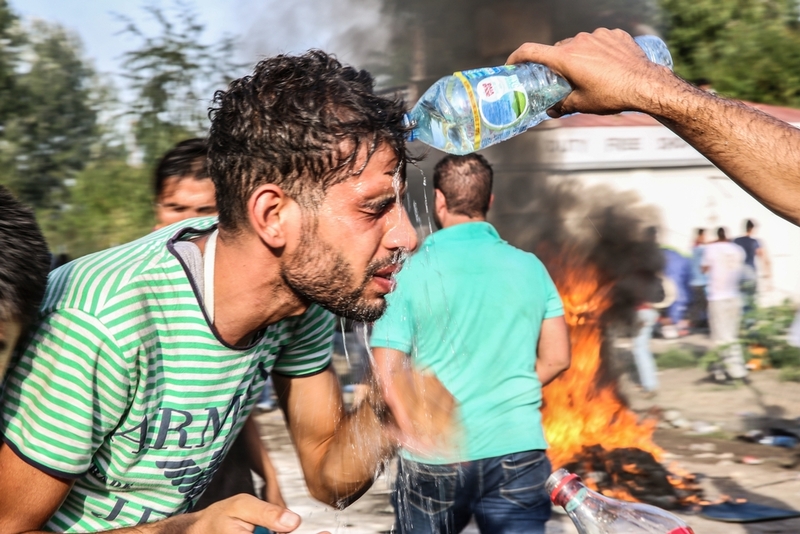 At almost every border along the route, refugees have been met with tear gas, rubber bullets or razor wire fences. MSF is running mobile clinics and distributing relief items at numerous points along the route. Our teams are constantly assessing the situation so we can adapt our operations to the changing routes, so we are present where we are needed most. On the Mediterranean, people in previous years generally attempted to make the crossing to Italy in the summer months, when favourable weather offered a better chance of completing the journey. But, with conditions worsening for refugees in camps in Lebanon, for example, as well as deteriorating situations in places like Libya, people are becoming more and more desperate. People are paying exorbitant amounts (up to US$10,000) to be smuggled on to rickety, overcrowded boats, knowing that there is a real possibility they may die in the crossing. Many EU countries, in their efforts to deter refugees from reaching their shores, have actively avoided policies that would make the journeys less dangerous and thus contributed to the risks people are having to take. Since May, MSF has run three search and rescue boats (one in collaboration with Migrant Offshore Aid Station - now discontinued) to help people in peril at sea, in an effort to fill the search and rescue gap.